River Cabin is a traditional stone building with eco credentials, set in an old cider orchard overlooking the mill stream. It is let on a sole occupancy basis for a minimum stay of 2 nights, the price reduces for longer stays. It sleeps up to 4 in a cosy bunkroom with a double bed and two bunk beds. There is a kitchen/lounge area, sunny dining porch, patio & private garden with picnic table, fire pit and BBQ. The price includes heating, hot water, showers, WiFi & use of bike store. From Easter - October a small campsite is operated alongside the cabin. 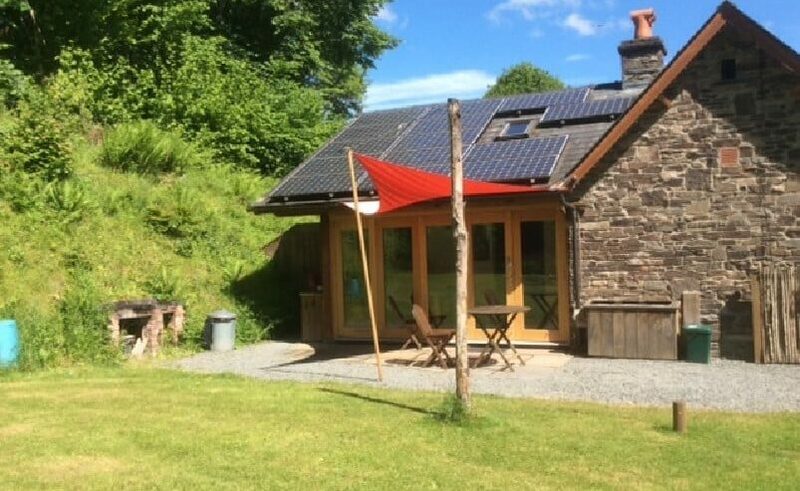 Located on Wye Valley Walk & National Cycle Route 8 - fantastic exploration base for walkers, cyclists and anyone wishing to relax and explore this beautiful part of Mid Wales. Canoeing, pony trekking and riding, gliding, bike hire, rope and climbing centre all available locally. This accommodation is featured on our map of South Wales and Pembrokeshire and here is its own website. All year, 24 hour access. River Cabin (sleeps 4) - minimum booking 2 people for 2 nights. GR SO 112 414. Set back from the A470 Brecon to Builth Wells road between the villages of Llyswen and Erwood. Trains: Builth (10 miles), Hereford (30 miles), Merthyr (30 miles). Daily bus service, ask for Trericket Mill - cabin is through field gate across the brook from the mill. For info see www.traveline-cymru.info. 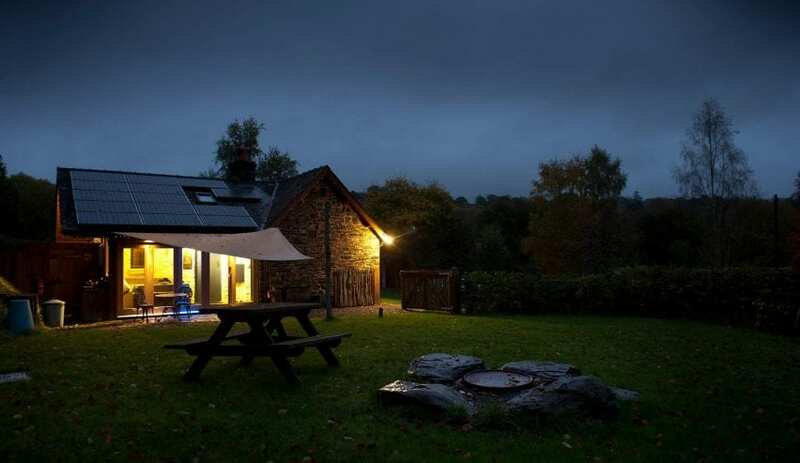 This accommodation allows dogs by arrangement, is near mountains, is available to individuals, is an 'Eco Hostel' and is on the Brecon Beacons National Park, the Small Hostels Map and the Lon Las Cymru. There’s plenty to bring you to the Wye Valley and to stay at River Cabin. The valley itself is, of course, famously beautiful and is home to a plethora of walks and cycle rides. 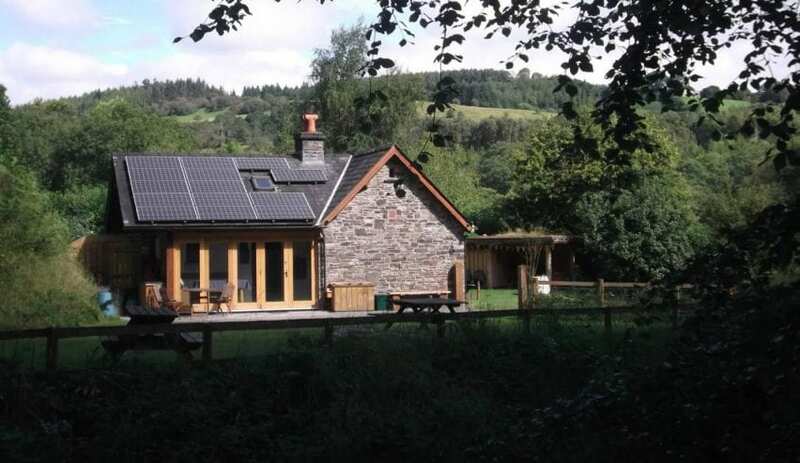 For example, the River Cabin is located on Wye Valley Walk & National Cycle Route 8 making it a fantastic base for walkers, cyclists and anyone wishing to relax and explore this beautiful part of Mid Wales. You can’t ignore the fact that it is ideally placed for canoeing as well – our own Sam Dalley wrote a piece on it not too long ago, making it sound like a fine old adventure. Sam too her young(ish) family with her. River Cabin is particularly well suited to young families. Self contained in a secure garden – which was once a cider orchard, it sleeps 4 if you all share a room. Toilets, showers and washing up station are all nearby. With that veranda and sliding doors, you can’t help but tumble out into an outdoor lifestyle. While we’re talking about the cabin, go and have a look at the pictures on IHUK and on their own website. You’ll see the charming location and you can’t miss the solar panelling, less obvious is the aquifer-fed water system – which gives a clue to the green credentials of this little gem. Take in the cool, handmade rustic furniture too. Welcome to the sweetest bijou bunkhouse. 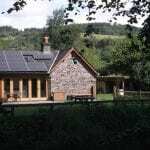 River Cabin, near Builth Wells in the Welsh Marches, is in a converted old stone building in a cider orchard. They are pretty proud of their eco-credentials, the headlines being: solar panels all over the roof and water is drawn from the aquifer deep underground. The interior is cosy and rustic. They’ve packed all sorts of features into this tiny space including a pretty well-equipped kitchen; a shower room and a toilet. Of course you will want to spill out into the grounds, through the glazed sun room and onto the private garden where you’ll find more space for dining, a barbecue and fire pit. The garden tumbles down to the river Wye – just a rushing mountain stream up here. Knowing that you’ve got this cosy bolthole to return to, you might venture out in search of experiences and adventure. Of course the river is just here so you might choose canoeing, kayaking or white water rafting. Right on the doorstep are The Brecon Beacons with all the hiking you would expect. Less well known though are the extensive cave systems under the Beacons – some of the longest in Britain – so caving is definitely an option. And, if riding is more your thing there are ample chances to be in the saddle atop either a horse or a bike. Check out their website and I’m sure you’ll agree this is a most charming little bunkhouse. Messing about on the river ! Idyllic accommodation for couples and young families. The River Cabin, in an old cider orchard, is 4 bed bunkhouse with camping. Idyllic simple accommodation excellent for couples, walkers and young families. Close to the Brecon Beacons and in a great location for canoeing on the River Wye. The cabin sleeps 2 people comfortably or up to 4 for families. It has one bedroom, a cosy kitchen/lounge, a sunny dining porch, and a shower/toilet. Simply furnished with rustic, hand made furniture. The kitchen is stocked with cutlery, crockery and basic cooking equipment.